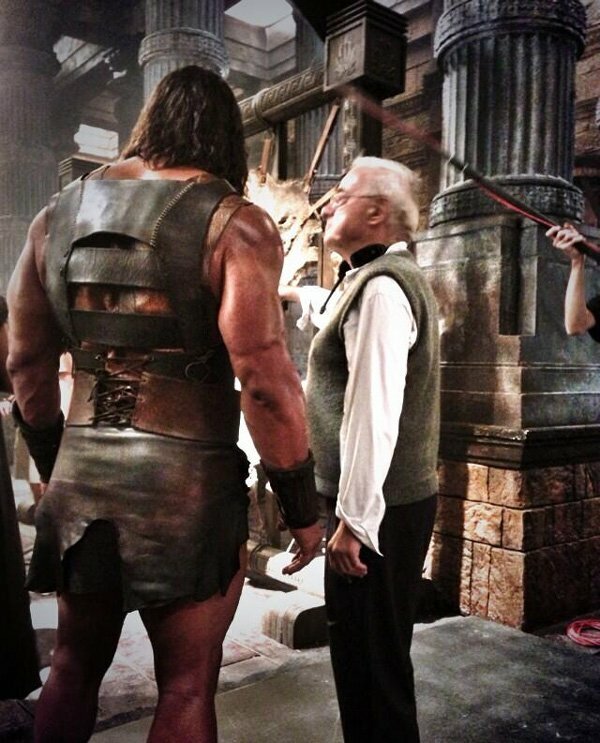 Dwayne Johnson, one of the most charismatic actors working in action movies today, is playing coy about his look in Brett Ratner's upcoming film Hercules. 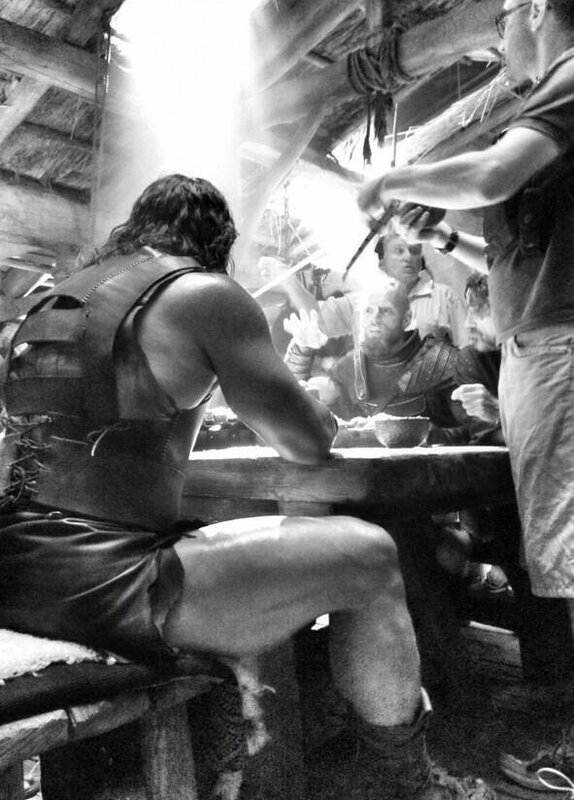 Over the last few weeks the star has shared a number of behind-the-scenes photos from the film, but each time he has had his face obscured or hidden from the camera. 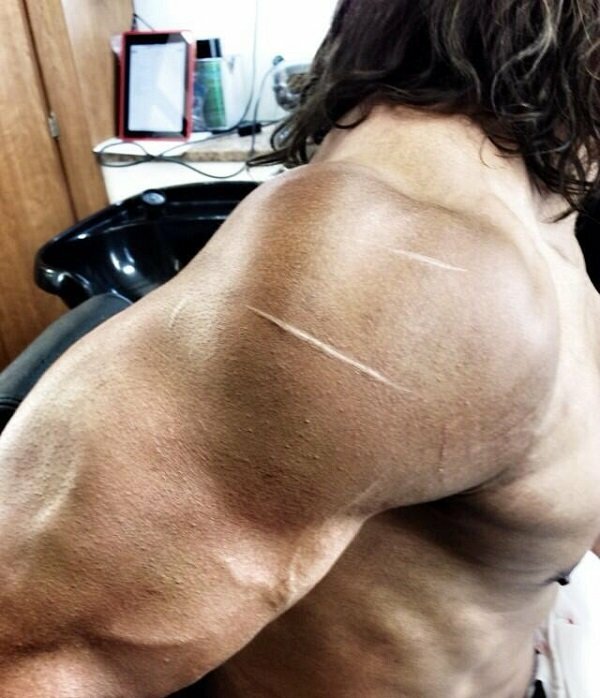 That tradition continues today with yet another picture of The Rock on set, which comes to us via the actor's Twitter account. This particular image was posted by Johnson partially so that he could share his thoughts about about the film's cinematographer, who is featured in the photo with the star. The message accompanying the photo reads, "Honor to work w/ HERCULES Cinematographer & multi Academy Award nominee Dante Spinotti. #MasterClass." The director of photography was previously nominated for both Michael Mann's The Insider and Curtis Hanson's L.A. Confidential, and has worked with Ratner on just about all of the director's other projects, including Tower Heist (his last feature film), X-Men: The Last Stand, and Red Dragon. It's interesting that Johnson is always hiding his face in all of the images from the set of Hercules, and could possibly tell us something about the character's look. We all know what the actor looks like, so why hide? Perhaps there's some kind of disfiguring scar work that's being done? Check out the last few set photos below. Scripted by Ryan Condal and Evan Spiliotopoulos and based on the graphic novel "Hercules: The Thracian Wars", the new film is set after the classic story of the 12 labors and is a new, more grounded take on the classic Greek myth. The story begins with Hercules (Johnson) working as a mercenary and traveling to Greece alongside five faithful companions. While he has long been able to use his reputation to make money and scare enemies, he comes up against a real challenge when the ruler of Thrace and his daughter come to Hercules to ask that he help them defeat a vicious warlord. He takes the job, but in order to claim victory he must once again become a hero and ascend to the level of his own mythos. Ian McShane, Rufus Sewell, Joseph Fiennes, Peter Mullan, John Hurt, Rebecca Ferguson, Ingrid Bolsø Berdal, Aksel Hennie, and Reece Ritchie co-star in the movie, which is being made by Paramount Pictures and MGM and will be in theaters on July 25, 2014.